My first concert was Weezer at New York’s Roseland Ballroom. It was 1995, I was 10 years old and they were touring the Blue album. Being there seemed like an initiation into the counterculture, and the concert tee I bought that night became the embodiment of this feeling. The design was simple: a lowercase, sans-serif “weezer” logotype on the front and, on the back, the words “rock music” in jagged, hand-scrawled lettering, wrapped around the flying “w” logo. With no tour dates or even a picture of the band, it looked more like something by Supreme or Stussy. It wasn’t an advertisement for the band so much as just a cool, well-designed tee. Most merch since has been an endless stream of junk: album art screen-printed onto cheap black T-shirts, dorm-room posters of press photos and trinkets with only a vague association with the music they represent. But in the past year, merch has once again become an integral part of the pop music landscape. This might be Kanye’s doing (his Yeezus tour swag is a gold standard), but every star now seems to take designing products almost as seriously as making songs. Artist-affiliated brands like Drake’s October’s Very Own have blurred the divide between merch and straight-up covetable streetwear. 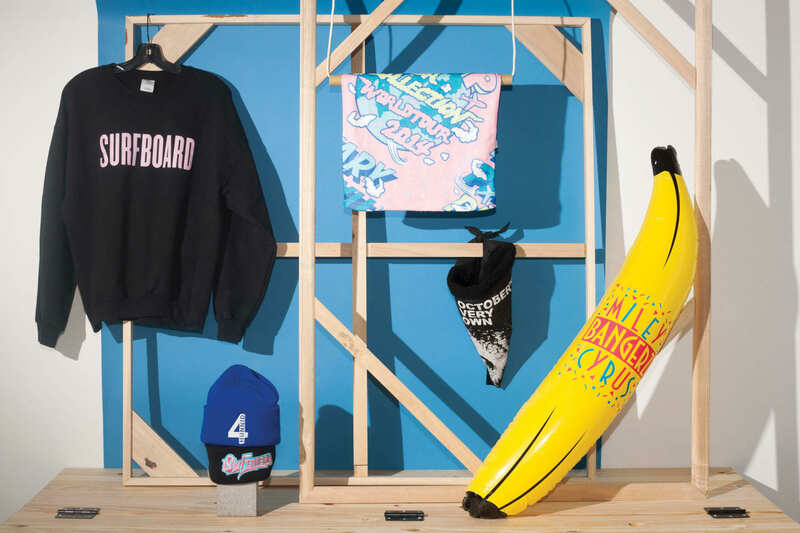 Odd Future has become as much a lifestyle brand as a rap collective; their LA pop-up store, filled with hoodies, socks and tie-dyed tees, is just a few doors down from Supreme. More than simply an appendage to a tour, this generation of music apparel is fully integrated into the larger experience of the artist and album cycle. Think: the elegantly timed media spectacle of Beyonce’s visual album, with all of its readymade hashtags like “surfboard” and “angel” written with bright pink text on high-quality black sweatshirts. Meanwhile, Miley’s Bangerz-era shock tactics have merged with branded rolling papers and inflatable bananas. In a post-Tumblr world, fashion, music and images all live online simultaneously, so really, why shouldn’t artists use all three? Clothing design is now just another facet of a musician’s artistic output; just like the Weezer shirt, this new type of merch yields singular pieces of design. While the look of Kanye’s Yeezus bomber jacket subtly refers to themes in the record, it will remain fresh and wearable long after radio stops playing the music.